Achieve research-grade results with the minimum effort. 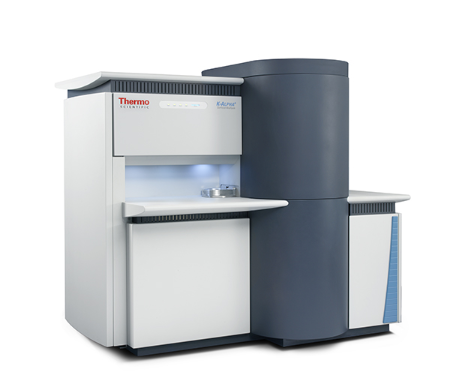 The Thermo Scientific™ K-Alpha™+ X-ray Photoelectron Spectrometer (XPS) System is a fully integrated, monochromated small-spot XPS system with depth profiling capabilities. State-of-the-art performance, reduced cost of ownership, increased ease of use and compact size make the K-Alpha X-ray XPS System ideal for a multi-user environment. Building on the legacy of the award-winning K-Alpha XPS System, the K-Alpha+ spectrometer delivers much improved spectroscopic performance. This leap forward results in faster analysis times, improved element detection, and the possibility to acquire data at higher resolution yielding better chemical state identification. Analytical options include the revolutionary dual mode ion source, a vacuum transfer module for moving air-sensitive samples from a glove box to the system, and the tilt module for ARXPS data collection. Equipped with the Thermo Scientific™ Avantage Data System, the complete surface analysis software system, the K-Alpha+ has a range of software features designed to optimize data interpretation, data reporting and usability. The K-Alpha+ XPS system meets the requirements of both experienced XPS analysts and newcomers to the technique, bringing together high performance, monochromated XPS and sputter depth profiling, with intelligent automation and intuitive control. • Options —Thermo Scientific™ MAGCIS™ Dual Beam Ion Source, vacuum transfer module, tilt module for ARXPS, sample bias module.